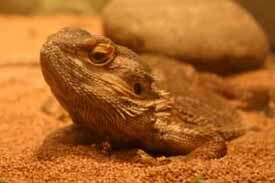 The Bearded Dragon is native to many different habitats and regions of Australia. They thrive in deserts, grasslands and woodlands in unpopulated and populated areas. It is said by many herpetologists who have come across Bearded dragons in the wild, that one can walk right up to one and the little guy wouldn't mind... and possibly even pick it up with little or no fuss being raised by the animal. Their temperament is extremely docile and trusting, therefore making it an excellent pet - even for children and beginners. Life Span: 3 to 10 years with proper care. The dragon here is ten years old. Feeding: Feed adult dragons 3-5 times a week; feed juveniles every day and provide mealworms 24- hours a day (for multiple dragons) In general, juveniles will eat more live food; adults mostly vegetation - per books. My dragon is at best a 50/50 diet mix and usually favors live food. At times it has eaten the pellets that you can buy in the pet shop. Pellets are good if you pet will eat them - they should be sprayed down to soften before feeding. They are well balanced with the proper amount of vitamins etc. Learn how to raise feeder foods. Housing: Due to the varied sizes and growth rates of reptiles, and their individualized needs, a professional breeder recommends at least a forty gallon aquarium (for small adults) and recommends larger tanks up to 100 for large adults. Your pet will need room to walk around and to turn comfortably. Screened enclosures are also nice – however if used be careful of drafts. Substrate: The following is from SunshineDragons a breeder of quality bearded dragons, http://www.sunshinedragons.com/caresheet.htm , "What to use on the bottom of your bearded dragon cage is a highly debated topic. We keep our babies with no substrate at all. When they grow to 10 inches or more they can be introduced to a substrate if you wish. You can use paper towels, newspaper, washed play sand, outdoor carpeting (without loops for the toes to get stuck in), reptile carpet, or what we use at Sunshine Dragons, non-adhesive, non-slip shelf liner. It comes in rolls that can be cut to size for your cage. It is easy to wipe off and to take out and scrub when needed. Some dragons ingest a lot of sand while eating. If you notice this you may want to feed your dragon in a separate feeding container. The best place to get sand in at your local home improvement store because it is far cheaper then anywhere else. Buy a 50 lb bags of washed and screened play sand, or 2 bags for large tanks. Fill the tank with a couple of inches of sand. This will allow you to anchor rocks and branches into the sand, and also most beardies like to dig. Most substrates such as Calci-Sand, walnut shells, and lizard litter sold at pet stores can harm your pet." Grooming and Hygiene: Give dragon a light misting shower every other day to keep skin humidified and easy to shed; the tank, however, should never be damp Carefully clip toenails when too long – if you keep one or two rough rocks, the toenails should be okay. Water: Provide a constant supply of clean, fresh, filtered, chlorine-free water in a shallow bowl that cannot be tipped over. One of my dragons actually drinks if I drip water from a spray bottle – I do this several times a week. Normal Behavior and Interaction: Will spend part of the day in a hiding spot in their habitat; Male dragons become territorial as they mature and should be housed separately. Watching two male dragons position is quite spectacular. Their throats darken and puff up – they hiss and threaten the “rival”. They will attack other males – so although the display can be fun to watch – it can lead to an injured pet. Head Bobbing - This is a dominance display. It is performed quite frequently during the breeding season to gain the attention and/or submission of a female Dragon and always when your Dragons are given new territory. Arm Waving - This is often seen being done by the females in the cage and the less 'dominant' males in response to a 'beard display' or 'bobbing episode'. This is the submissive gesture in recognition and deference to the dominant male. Along with arm waving. Raised tail - This is most often seen during breeding season. It seems to signify a certain level of alertness and acceptance. Juvenile Dragons will also do this when stalking its prey.